Accidentally Deleted some important contacts in Gmail, No problem, with simple trick and steps you will restore deleted contacts in Gmail easily. 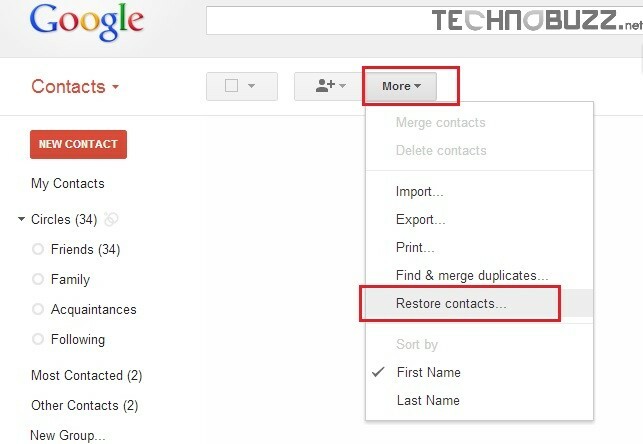 Recently Google introduces a new feature Restore Contacts in Gmail setting. With the helps of the new new feature you will recover or restore all your deleted contacts without using any Chrome addon or any other third party application. But remember you can only recover the last 30 days contacts. If you deleted the contact 30 days back, then it’s not possible for you to restore those Gmail contacts on your account. With this feature not only you will recover a deleted contact that you have accidentally deleted, but also undo an addition, a merger or contact sync with your smartphone went wrong and also take the backup of your contacts on your desktop. 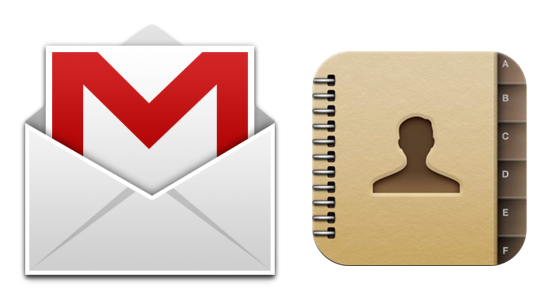 So lets take a look how to restore deleted contacts in Gmail. Step 1. Login to your Gmail account with you User ID and Password. By default, the inbox will be displayed. Step 3. Now you are on the Gmail Contacts page, here you can see lots of option such as My contacts, Most contacted etc. From this page click on the More actions and from the drop-down list select Restore contacts. Step 4. 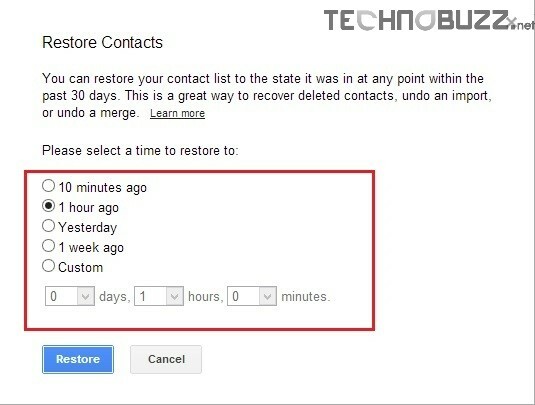 Now a Restore Contacts window pops up on your Gmail Account screen, From here all you have to select a time to restore and hit Restore. Please note that you can only restore deleted contacts within the past 30 days. Step 5. After that, you will see a notification on the top of Gmail’s user interface that your contacts are restored on your account. You can click on Undo to rollback the changes. That’s it, now your deleted Gmail contacts are restored on your account. From the Same More Option you can Import and export your contacts, print all your contacts and merge duplicate contacts. So now you know how to recover all your deleted contacts from the gmail account, so let us know what do thing about this Gmail feature. If you are looking for some for Gmail tips and trick, click here!